Each night this week I’ve been studying Java Server Faces (JSFs) for a potential work project. Although I could only handle 1 hour of manual labor this weekend until my hands were blistered such that I had to stop, I continued to chip brick out of the front side walk. I’ve now realized that I have to not only get rid of the brick, but also the morter beneath the bricks. I also vacuumed up afterward so you should get a better picture this time. For the remainder of the weekend I worked on learning Java Server Faces (JSF) by installing several examples and reading tutorials. I did chores around the house this weekend including mowing the lawn, weeding the front garden, and working on the front sidewalk. 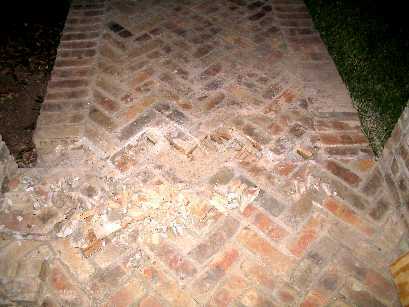 The bricks on the front walk have been breaking up due to the foundation shifting. 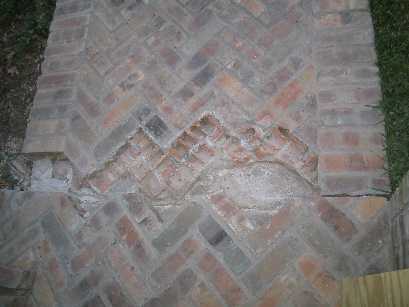 So I’m in the process of chipping out the mortar and broken bricks. I’ve only just begun. I’ve bought a masonery circular saw, and mortar. I’m planning on creating an expanson gap between the house foundation and the sidewalk. When the house was built I saved a stack of bricks out back for situations like this. Now let’s hope that I can do this job since I believe that brick laying is a skill. My second cousin, Bert Hutchings, visited us this weekend. He is over on a business trip in Houston. A coworker dropped him off at our house on Saturday afternoon. He wanted to see Austin so we went on a tour provided by SegCity. I’ve wanted to try this and we had a fantastic time on these neat devices. We first had a 30 minute training, then we were off for 2 1/2 hours tour. 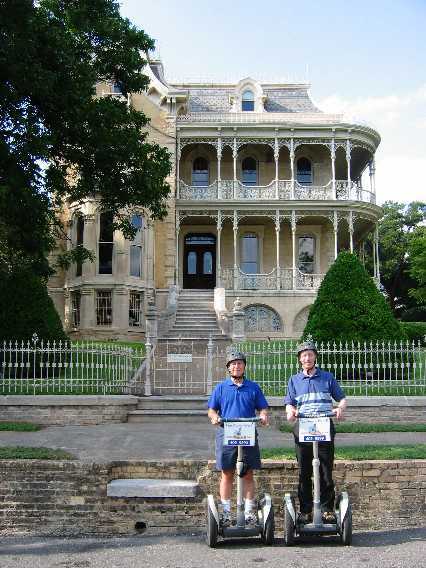 We glided all over Austin from 6th Street to Town Lake to the Capital to the UT campus and back. The tour was like a 3 hour amusement ride. What fun. And for once in my life I was 6 feet tall. Today we drove to Houston and toured the Johnson Space Center. We rented audio self-tours, had a tram ride through the center, saw two movies and in general had a good time. Then we dropped Bert at his Houston hotel and drove home to Austin. Although we’re now exhausted we had a great time being host and hostess to him. A few days ago it struck me that on our recent road trip I saw everyone in Kathy and my immediate family. This included both our parents (Kathy’s mother and my father), all our siblings (Kathy’s sisters and my brother) and all their children (except for Chris in Philadelphia). I even saw one of my cousins (my father’s brother’s son, Andy). Somehow I feel that is quite remarkable since it was totally unplanned. OK, I finally broke down and got a new desktop machine. I went to Fry’s and bought the cheapest thing they offered. It’s noisy, but who cares. It is a 3GHz P4 with 256MB memory, and a DVD RW drive. It was only $379. I also bought 1GB extra memory for $179. Now I’m in the process of setting it up. I’ve been spending several hours doing this because I’ve got to transfer over all my mail files, address books, installed software, etc. It’s a ugly job, but I’m not installing everything that was on the old machine. I’m being more selective. During the vacation these past three weeks we had turned off the air conditioning in the house. We arrived home to a very hot house. When we walked in at 1 AM the house was 90 degrees. We turned the AC on, all the ceiling fans and tried to sleep. When I woke up I found that the temperature was still 81 degrees. The AC was not working. So I called the local HVAC service company. Well we have two units, one for the upstairs and one for the downstairs. One had no freon, and the other had 30% freon. The service man said that the coils in the attic were old (he actually was surprised that they were still working after 10 years). So instead of doing the simple short-term fix and replacing the coils, we’re replacing the whole system for $10K, yup, that’s 10 big ones. Needless to say that we have to take a loan out for it. But then that’s life in modern america. I just can’t seem to get ahead. Sheesh! Well we left Liberty, Indiana at 4:35 AM on our return trip. It was still dark out. We carefully threaded our way through Liberty watching our speed. On the way out of town as I sped up to 40 MPH all of a sudden a cop turned on his lights and pulled us over. It was a young guy. He said that we had been doing 42 in a 30 MPH area just prior to the 40 MPH sign which was in sight. Sheesh! To make a long story short he let us go with a warning. Maybe it was because we said that we had just left our relatives home. I don’t know. But from then on I was worried that some other town constable was going to get us. Once I was on the interstate highway I relaxed a bit. To break it up we first drove to Clarksville, Tennessee to Homespun Corner, a wonderful cross stitch store, where Kathy spent some time and some money. Then it was on the road again. This time we drove straight through and arrived back to a very hot house at 1 AM. The road trip was over. The posts are getting shorter. Sunday some of our family crowd left at the tail end of the graduation party. And so the end begins. Not only the end of the graduation, but the end of our road trip. Monday was spent resting from the hectic weekend. We’re still at Melanie and Tom’s home in Liberty IN. Grandmommy and Katie left at 10:30 then Justin and Matthew left at 11 AM. Chinese food was enjoyed for dinner. The numbers continue to dwindle. You are currently browsing the Watt's Up blog archives for June, 2005.